On Wednesday, New York Magazine reported on a potentially fatal accident for the Trump campaign and its "woman problem." It happened in the Spin Room on live TV, immediately following the first presidential debate of the 2016 race. In a major Rick Perry "oops" moment, Trump's campaign manager, Kellyanne Conway, took to the airwaves to stand up for her candidate, but instead ended up doing the opposite. 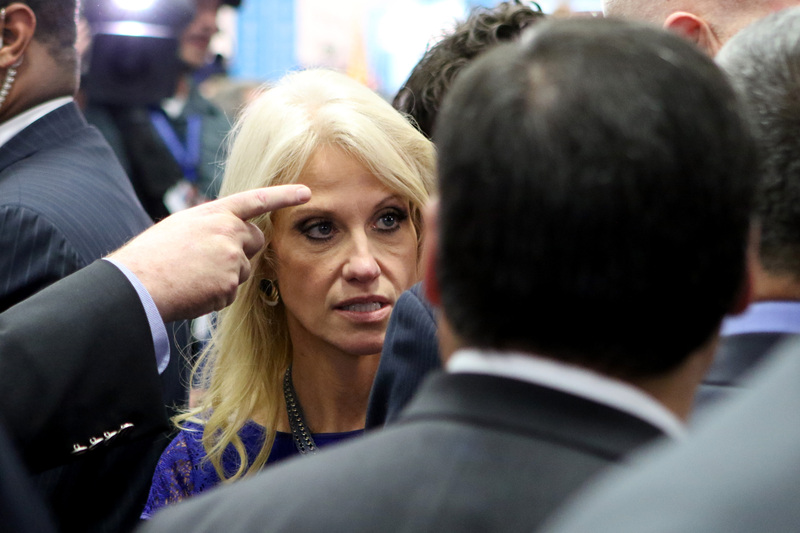 Conway, who joined the team after multiple Trump campaign shake-ups and has reportedly sought to soften his message — while also, from an optics standpoint, making him seem more "woman-friendly" — has inadvertently dug the perception that Trump has abused women a little deeper. [Trump] made it clear that he came ready to say some rough things if [Clinton] was going to challenge him about his abuse — about his record on women. She quickly tried to clean up after herself, catching the mistake mid-tumble by correcting "abuse" to "record," but the damage was already done. And what we have been hearing over and over from the candidate's own mouth was finally reinforced by the one person who could have served as his saving grace. You can watch the misstep above. It's important to note that this comes after the especially condescending debate performance by Trump. The first address he uttered to Clinton included an attempt to mock her title as secretary of state. "Now, in all fairness to, uh, Secretary Clinton ... yes? Is that okay? I want you to be very happy. It's very important to me," he said with a smirk on his noticeably less-orange-than-usual face. Trump's continued jabs rolled off Clinton's back — almost literally, as at one point, she seemed to shimmy the insults right off of her. But one thing that Clinton didn't let go was how Trump verbally abused a particular Miss Universe winner. Clinton defended the contestant, wielding accusation of abuse that has been reverberating in the media's echo chamber ever since. According to a report in The New York Times, Trump would call Miss Universe winner Alicia Machado "Miss Piggy" because of the handful of pounds she gained after she received the crown. The contest owner even invited the media to watch Machado work out without her knowing, announcing to everyone in attendance that "This is a person who likes to eat." Trump also called Machado "Miss Housekeeping" in reference to her Latina descent. What's more is, not only did Trump scoff at Clinton and interrupt her when she told the story during the debate, but the next day he doubled down, defending his comments to Fox News. Even the talking heads at the network seem to have recognized the move as a serious lapse in judgement.